The Double Ninth Festival (Chung Yeung Festival in Hong Kong, Chōyō (Japanese: 重陽), Vietnamese: Tết Trùng Cửu), observed on the ninth day of the ninth month in the Chinese calendar, is a traditional Chinese holiday, mentioned in writing since before the East Han period (before AD 25). The day is also known as the Chrysanthemum Festival (菊の節句) in Japan. 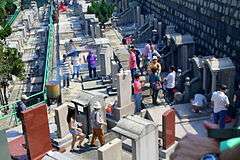 On this holiday some Chinese also visit the graves of their ancestors to pay their respects. In Hong Kong, whole extended families head to ancestral graves to clean them and repaint inscriptions, and to lay out food offerings such as roast suckling pig and fruit, which are then eaten (after the spirits have consumed the spiritual element of the food). Chongyang Cake is also popular. Incense sticks are burned. Cemeteries get crowded, and each year grass fires are inadvertently started by the burning incense sticks. Once there was a man named Huan Jing, who believed that a monster would bring pestilence. He told his countrymen to hide on a hill while he went to defeat the monster. Later, people celebrated Huan Jing's defeat of the monster on the ninth day of the ninth lunar month. In 1966, Taiwan rededicated the holiday as "Senior Citizens' Day", underscoring one custom as it is observed in China, where the festival is also an opportunity to care for and appreciate the elderly. Double Ninth may have originated as a day to drive away danger, but like the Chinese New Year, over time it became a day of celebration. In contemporary times it is an occasion for hiking and chrysanthemum appreciation. Stores sell rice cakes (糕 "gāo", a homophone for height 高) with mini colorful flags to represent zhuyu. Most people drink chrysanthemum tea, while a few traditionalists drink homemade chrysanthemum wine. Children learn poems about chrysanthemums, and many localities host chrysanthemum exhibits. Mountain climbing races are also popular; winners get to wear a wreath made of zhuyu. In Japan, the festival is known as Chōyō but also as the Chrysanthemum Festival (菊の節句) and is most commonly celebrated on the 9th day of the 9th month according to the Gregorian calendar rather than the lunar calendar, i.e. on September 9. It is celebrated at both Shinto shrines and Buddhist temples. They are wearing the zhuyu, but one is not present. The Hindus observe this day as Mahanavami (Great Ninth Day). Ninth day of Dashain festival. Where people worship goddess Durga for victory over demons. ↑ "Chrysanthemum Festival". The Free Dictionary. 2010. Retrieved 2015-06-08. ↑ "Chrysanthemums, Climbing, and Consideration of the Elderly - Double Ninth Day". Gio.gov.tw. Archived from the original on May 15, 2008. Retrieved 2008-10-07.